Wolf's milk slime fruiting bodies growing on rotting wood. Photos by Francine Beaujot (top left), Nancy Shackelford (right), and Heather Polowyk (bottom left). 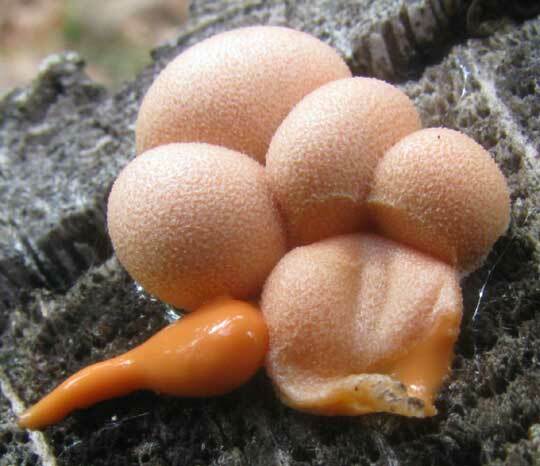 Wolf's milk slime is a slime mould with a small (diameter to 1.5 cm) ball- or cushion-shaped fruiting body. It varies greatly in colour depending on age, from the greyish-pink colour of the immature specimens seen above to yellowish-brown or greenish-black. The cushion has a rough to warty texture, and releases a pinkish-grey paste-like flesh when popped. This flesh, which contains spores, turns powdery and ochre brown in colour with time. 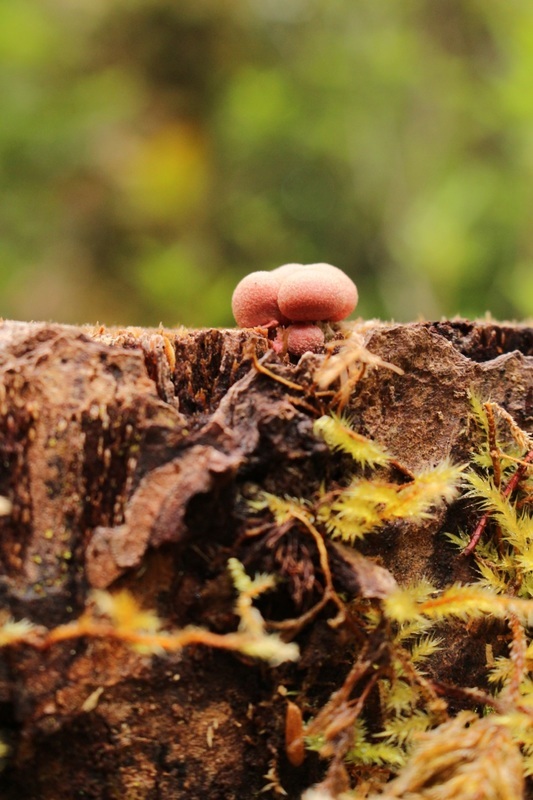 Wolf's milk slime fruiting bodies can be found on dead wood — particularly logs — from June to November. This species is widespread throughout North America. The less common Lycogala flavofuscum is larger with a hard, shell-like outer wall. Wolf's milk slime consumes bacteria as well as yeast and other fungi, and is in turn consumed by other organisms, including other slime moulds and fungi. Like other slime moulds in Class Myxogastria (or Myxomycetes), its plasmodial form exhibits behaviours equivalent with those of animals with muscles and nerves, including movement towards or away from food and light. 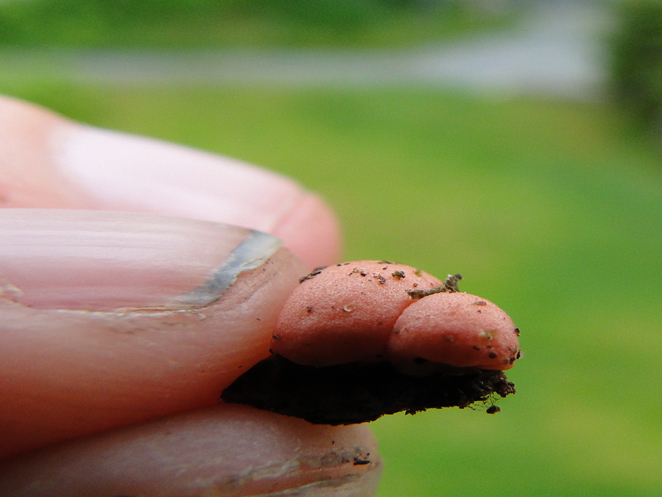 See the UBC Botanical Garden's profile on wolf's milk slime and the myxomycetes for more information. Lindhoff, G. H. The Audubon Society Field Guide to North American Mushrooms. New York: Alfred A. Knopf, P. 848. Mosquin, D. (2012). 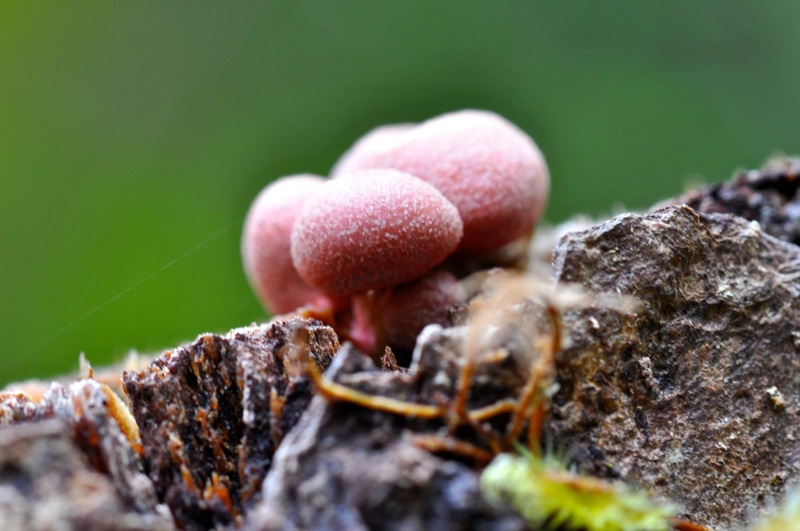 Lycogala epidendrum. Botany Photo of the Day. UBC Botanical Garden & Centre for Plant Research. University of British Columbia, Vancouver. Accessed 11/09/2015. Wolf's Milk Slime (Toothpaste Slime). Discover Nature. Missouri Department of Conservation. Accessed 11/09/2015.